We must admit that our expectations were running low for Palm’s do-or-die press launch yesterday, but we’ve been left blown away by their hugely impressive new Palm Pre handset and WebOS operating system. 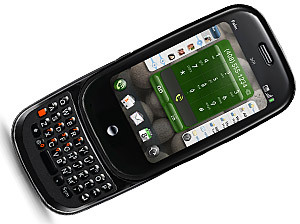 Featuring a 3.1-inch accelerometer-sensed 320 x 480 multi touch display with full QWERTY keyboard in portrait orientation, the phone packs in all the features conspicuously absent from previous Palm OS handsets, including 802.11b/g WiFi, GPS with turn by turn mapping, Bluetooth with stereo A2DP and EV-DO Rev. A 3G. 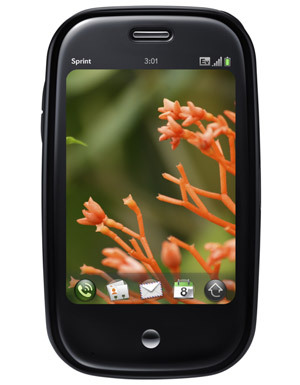 Powered by TI’s new OMAP CPU, the handset comes with 8GB of built-in flash storage (but no SD card slot), a 3 megapixel camera with LED flash, mass storage-friendly microUSB plug, removable battery and – huzzah! – 3.5mm headphone jack. A truly revolutionary multitasking user interface serves up a truly slick “desktop and cards” paradigm, where apps are brought up via a launcher bar. New cards containing web pages, IM conversations, emails etc, and can brought up from the bottom of the screen, with active cards flicked through like Apple’s Coverflow. When you’ve finished working on a card, they can be swished away or closed by dragging them off the top of the page. 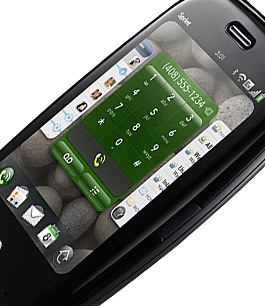 There’s also a cunning touch-sensitive gesture region under the display, where you can use gestures to control the handset without affecting content in the window (thus getting rid of the problem with touchscreen where scrolling onscreen can, for example, accidentally click on a link on a web page). There’s also a set of advanced gestures that let you, for example, bring up a launcher bar and immediately launch an app. Email support for Microsoft Outlook, POP3, IMAP, Gmail, Yahoo, AOL is built in, and email, SMS and IM conversations can all be grouped on one screen, with replies automatically being routed via the correct app. Very clever. The phone picks up copies of contacts when users browse sites like GMail, GoogleTalk and Facebook to compile a master address book of all known contacts and the various means to get in touch with them. When viewing a friend’s contact card, the user can see their regular contact details as well as their status on chat services – and start chatting with them with a single click. There’s even an optional wireless charging accessory called Touchstone, which is a a smooth pebble-like gizmo that lets users charge their handsets just by placing it on its surface. Palm’s new package adds up to a truly remarkable offering, with the compact smartphone offering a truly innovative interface that even outdoes the iPhone. The way the phone handles contacts is truly impressive, the multitasking seems extremely smooth and if the the initial reviews are anything to go by, Palm is on to an absolute winner with this one. So far, only bare details of a deal with Sprint in the US have been announced, but hopefully UK pricing and availability will be announced shortly. There’s no doubting that Palm has delivered a hugely desirable, class-leading phone that makes a quantum leap over some of the touchscreen handsets that followed in the wake of the iPhone, but the real task facing Palm now is getting the phones out on time. Competitors will be all over Palm’s idea like a rash, so Palm has to get its phone to market quickly – and that includes Europe. 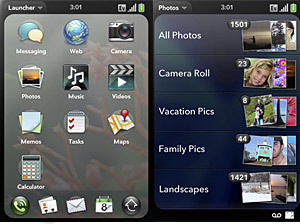 As a dedicated iPhone user, I experienced something very strange and quite unexpected while watching Palm demo the new OS: my iPhone suddenly felt old and played out. 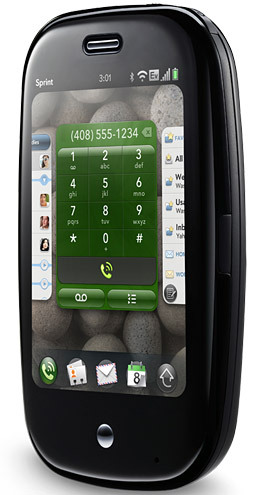 It’s like Palm started with the iPhone, copied all the best ideas, and then made the whole package better. Palm today announced what promises to be the product that finally matches and even betters the Apple iPhone, and certainly looks to be the most important product announced at this year’s Consumer Electronics Show. Palm the good of the iphone is very sold. For advertising, very good.